A day after the All India Muslim Personal Law Board opposed the Centre’s proposed bill by calling it anti-women, unislamic and unconstitutional, the victims came out to slam the Board. LUCKNOW: A day after the All India Muslim Personal Law Board (AIMPLB) opposed the Centre’s proposed bill by calling it anti-women, unislamic and unconstitutional, the victims came out on Monday to slam the Board for allegedly trying to derail the process by playing a stumbling block in the path of bill which was yet to be introduce in the Parliament. 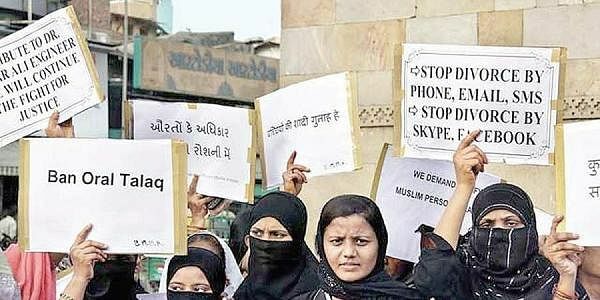 The triple talaq victims have questioned the silence of AIMPLB when the women of the community were being harassed and handed out sudden triple talaq either by uttering it thrice or conveying it through any other medium, including social media tools, thus ruining their life for ever. On the other, Shaista Ambar, founder chairperson of All India Muslim Women Personal Law Board, also criticised AIMPLB for validating the practice of triple talaq all this long instead of taking a judicious approach to find a proper solution to the issues affecting both the sides through counselling and dialogue. “AIMPLB was set up in 1972 when such socio-familial issues started cropping up frequently in the Muslim community. The Board was constituted with the mandated to safeguard the interests of divorce victims and find an amicable solution to settle such issues between the warring parites. But it never worked in accordance to the purpose of its establishment,” says Ambar adding that the board never came to the rescue of victims of triple talaq which was awarded to them in some of the most absurd ways. “Now when the government is moving ahead with a bill to help curb such a weird practice which has destroyed the life of hundreds of Mulsim women and their children, AIMPLB is also poking its nose. Where were they when we were suffering day in and day out?” asks Chandani, 34, an instant triple talaq victim who has a 6- year-old daughter to take care of. While AIMPLB raised objections to the Centre’s bill for criminalising the practice by making the provision of a three-year jail term for the offender, Ambar supported the government bill saying such men who were misusing the right to talaq in Islam should be punished. “The AIMPLB should have coordinated with the Central government and proposed ways and means to stop the misuse of talaq by Muslim men. The Board, instead of seeking the review of the government bill, should rather have suggested solution to settle such issues amicably between the parties under the realm of Shariat to save hundreds of victims from going through the rigors of talaq,” maintains Ambar. “We too have sent a draft conforming to the Islamic laws under Hadees over talaq to the Centre to be included in the bill. We have proposed punishment and penalty to anyone who denies the rights of a woman in the community on pretext of talaq. The Centre is believed to have included our suggestions in the final bill and I am sure it would help stopping the exploitation of Muslim women through triple talaq”, avers Ambar. Meanwhile, the over 50 victims of triple talaq in western UP came out backing the clause of the proposed bill making triple talaq a criminal offence. They also condemned AIMPLB’s stand on the proposed bill. Narrating her ordeal even after triple talaq in October 2015, 22-year-old Mehrunissa said: “Even after my triple talaq, my former husband keeps threatening and physically assaulting me and my family. I was forced to quit my job as he would daily stop me and would beat me for working. He does not give any maintenance either. I can’t work because of him. How will I take care of my child if I will not be allowed to work?,” she asked and added that It was necessary for such people to go to jail. “AIMPLB should not oppose 3-year term for offenders,” said Mehrunissa.